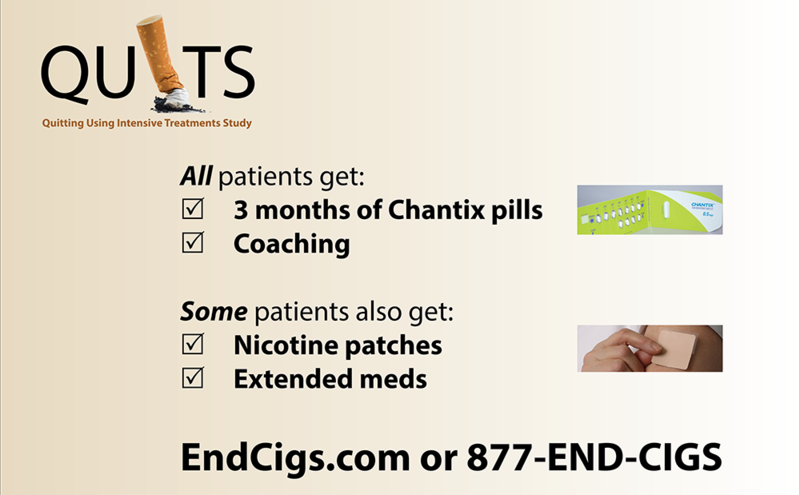 Welcome to the website for QUITS, which stands for the Quitting Using Intensive Treatments Study. This is a research study at the University of Wisconsin to help people quit smoking. TO SIGN UP in the Milwaukee area, click here. TO SIGN UP in the Madison, Wisconsin area, click here. We will contact you with more information. Your information will remain confidential. Signing up does not require you to participate. If you participate, you’ll get FREE coaching and medication to help you quit smoking plus up to $310 for completing the research study. The purpose of this study is to see whether combining two proven medicines to help people quit smoking is more effective for people who have had a hard time quitting.